Below are answers to the most common questions about my services. The link menu on the right side of this page has direct links to all consulting pages. What services does Inventory Operations Consulting Provide? What types of businesses does Inventory Operations Consulting serve? I've had clients from numerous industries including industrial goods, service parts, e-commerce retailers, wholesalers, machine shops, automotive, pharmaceutical, publishing, and agricultural. I've had small clients with fewer than ten or so employees, and very large clients with well-known names. My core target customers have always been small to midsized manufacturers, distributors, and fulfillment operations. What makes Inventory Operations Consulting different? The combination of my expertise and my unique approach towards consulting. I don't simply categorize your business as a certain "type" and then recommend canned solutions. Instead, I quickly study your business (through conversations and analysis) and identify those characteristics of your business that may not fit into a "standard solution", then formulate solutions that fit your specific needs while taking into account the practical realities of your business. In addition, I've managed to make my services truly affordable. I've done this by streamlining the consulting process itself. This allows me to get you the help you need with as little of my time (and your money) as is practical. My E-consulting services are an example of how I've managed to make consulting affordable (see section below). A typical assignment for me usually ends up costing between $300 and $3,500, with $1,000 to $2,500 being the most common. I have occasionally done very brief assignments that cost less than $300 (some as low as an hour or two) and more extensive projects that cost well over $5,000, but I've gotten pretty good at managing my involvement in projects to a level that gets the client the assistance they need without breaking the bank. In fact, over the years my project-level costs have gone down even as I've raised my hourly rates. This is simply the result of me refining my services to get you what you need as quickly and efficiently as possible. These ranges represent local clients or remote consulting (e-consulting) for non-local clients. Additional costs will be incurred if I have to travel. See my Rates and Terms for more information. 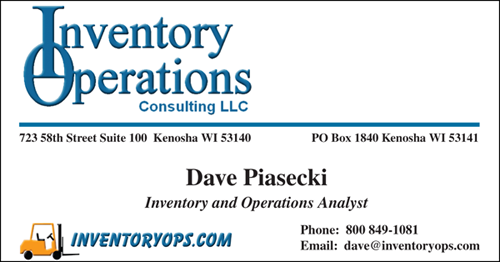 Inventory Operations Consulting L.L.C. is based in Kenosha, WI. For businesses in my primary service area (Southeast Wisconsin and Northeast Illinois including Kenosha, Racine, Milwaukee, and Chicago areas), I offer affordable on-site as well as E-consulting services (most local projects consist of both). For businesses located outside of my primary service area, I primarily offer E-consulting services, though limited on-site services may be available based on my schedule and the specific project. My business cards list my title as "Inventory and Operations Analyst". I have over 25 years experience working in inventory management, manufacturing, and warehouse operations as both a practitioner and consultant. I’ve done everything from setting up software systems. designing warehouse layouts, developing complex inventory calculations, and managing distribution centers, to picking orders, driving forklifts, and loading trailers (yes, I've done it all). This combination of hands-on experience and high level of analytical and systems skills, along with my unwillingness to simply accept standard practices, conventional wisdom, or "next-new-thing hype" without careful scrutiny sets me apart from other experts. I've been an independent consultant for over 10 years, and have authored books and articles on topics related to inventory management and warehouse operations. More>>.